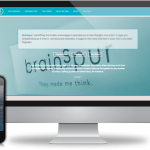 Brand strategy partner Brainspur designed this custom built Nashville Geek WordPress website. Over the years, Cindy Sargent and Kevin Hinson have strategically positioned brands that resonate in meaningful ways with audiences. They’ve been responsible for helping national and regional clients engage and form lasting relationships with their customers. Check out their new website. It WILL make you think. In a good way.